Body: U.V. Light Olive Ice Dubbing, some U.V. Black Ice Dubbing mixed in. 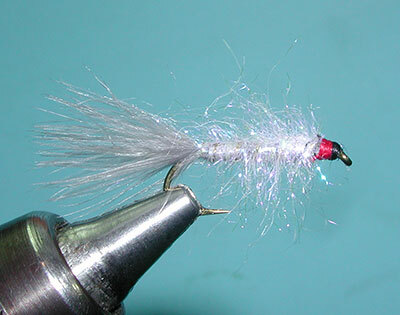 Local Guide, Tom Loe of Sierra Drifters, uses a variation of the Mohair Leech pattern with his "Punk Perch". Rather than using Angora Goat or Seal Dubbing, Tom uses Ice Dubbing which is a finely cut mylar. 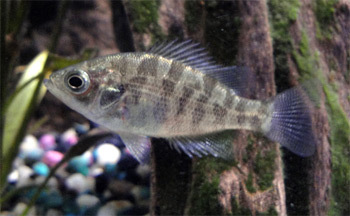 The Punk Perch is tied somewhat differently with a thin rear portion to the body and a much longer dubbed upper body in which the Ice Dubbing fibers reach the base of the tail. Use a dubbing loop and adjust the amount of material so that the bulk will be wound nearest the forward portion of the shank. As you twist the loop, the material will also be somewhat tighter around the rear portion of the shank and this will assist in the profile. In the water, this profile is really good for mimicing a Sacramento perch fry which is a prevalent food source for large trout within Lake Crowley. Keep the pattern less than 2 inches since the trout will not feed on larger patterns due to the sharp fin spines that develop on the fry. The translucent effect of the material gives real life to the fly. The hook is a 2x long wet fly. 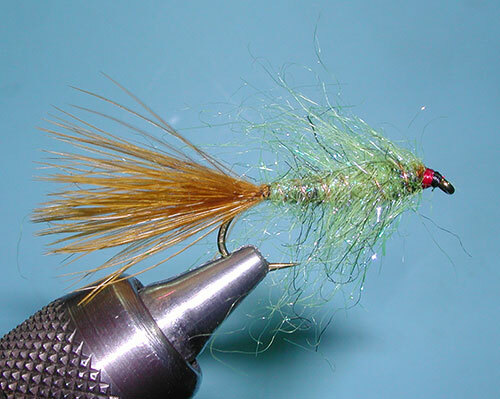 He also incorporates a thin red thread collar behind the head for gills which can be a strong triggering mechanism to the fly as an alarmed baitfish with it's gills flashing. "Agent Orange" is another variation that Tom Loe prefers to use when Daphnia are the main food source at times during the summer at Crowley Lake. The body material is the SLF dubbing that Davy Wotton and Poul Jorgensen made famous. Dave Whitlock submitted his blends to SLF to match his patterns. It is an excellent synthetic blend with many highlight colors of Reds, Orange, Blues, and Yellows. 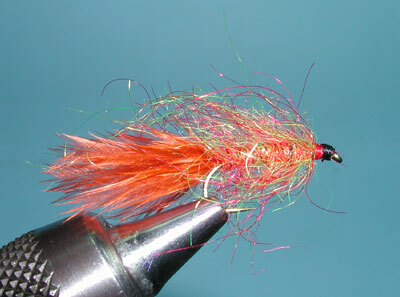 Tom ties this material the same as his Punk Perch with the longer fibers closest to the eye. The hook used is a dry fly hook with a wide gap and downturned eye. Daphnia are microscopic sand fleas and this fly represents a cloud of them. The fly is fished motionless.